Located in the Canadian province of Alberta, Canada is a beautiful city with scenic views of two rivers, unique historic attractions, romantic restaurants, great parks and museums. Explore the exhibits at Fort Calgary, and stroll through Canada’s largest living history museum, Heritage Park Historical Village. 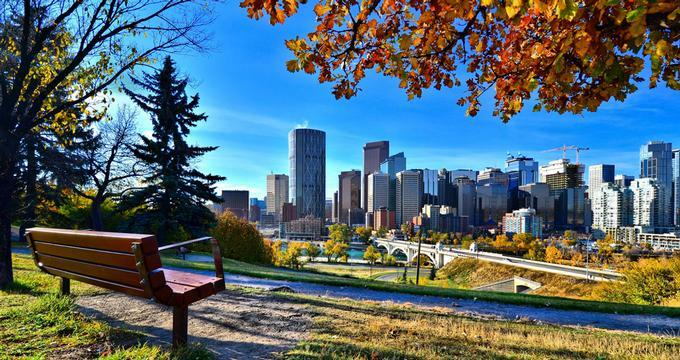 Other top things to do in Calgary, Canada include the National Music Centre, the Calgary Zoo and Skyline Luge Calgary. The National Music Centre is a 160,000 square-foot facility in Calgary’s East Village that is dedicated to sharing the love and understanding of music. Designed by Portland architect Brad Cloepfil and located in the historic Customs House building, the Center features a collection of over 2,000 rare instruments and artifacts, including one of Elton John’s pianos, as well as selections from the Canadian Music Hall of Fame and the Canadian Country Music Hall of Fame. It also boasts a variety of interactive and engaging exhibits, displays, and daily performances and offers guided docent-led tours for visitors to enjoy. The National Music Centre is one of the top Calgary attractions. The historic King Edward Hotel is part of the National Music Centre facility and operates as a live music venue seven nights of the week. Heritage Park Historical Village is Canada’s largest living history museum, featuring more than 200 exhibits and attractions spread over 127 acres of beautifully maintained, natural parklands. History buffs and leisure seekers alike will delight in the array of things to see and do in the park, which include a 1860s Fur Trading Fort and First Nations Encampment, a 1880s Pre-Railway Settlement, the Heritage Town Square, and the Heritage Park Historical Village. 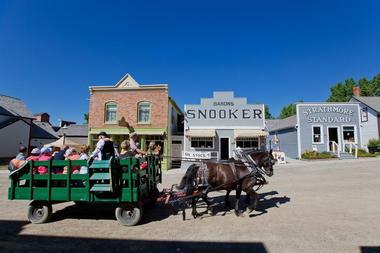 The Heritage Park Historical Village is a living historic village from the early 1900s featuring an array of exhibits showcasing the lifestyle during that time. Explore an authentic steam train, an antique midway, and some businesses and shops, such as a working printing press and blacksmith shop, an ice cream parlor, and a bakery. 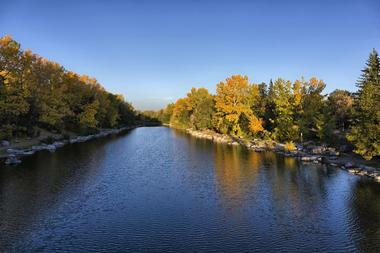 If you are wondering what to do in Calgary today, this is a great place to visit. Costumed interpreters are on hand to share information and answer questions. The Calgary Pathway System is an extensive network of pedestrian pathways and cycling trails that connect the city’s natural parks and communities and offer a fun and healthy option of getting around and enjoying the outdoors by walking, jogging, running and cycling. The system is made up of a combination of regional and local pathways, which provide access to various facilities throughout the community, and non-paved trails, which offer recreational routes through the city’s parks. The paths and trails wind along the Bow and Elbow Rivers, pass by the Nose Creek and West Nose Creek, wind through the Fish Creek Provincial Park and visit the Western Irrigation District Canal and Glenmore Reservoir. 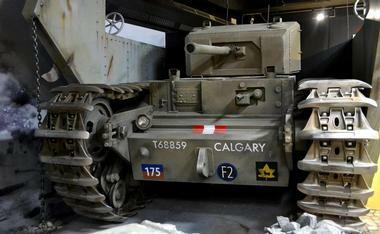 The Military Museums are dedicated to Canada's military forces and educating the public about the honorable role the navy, army, and air force have played in world history. The Museum features eight distinct museums and galleries which visitors can explore and gain a better understanding of the victories, tragedies, and sacrifices of the Canadian Forces. Experience life at the helm in a Second World War wheelhouse in the Naval, Army and Air Force Museums of Alberta or walk through a First World War trench in the four regimental army museums. In-depth tours of the museums are offered, including through the Naval Museum and Tank Park, as well as a close-up tour of the world-renowned Mural of Honour. Fort Calgary is an historic site and museum dedicated to presenting and preserving the history and heritage of Calgary. Located on 40 acres of parkland at the confluence of the Bow and Elbow Rivers, Fort Calgary was established in 1975 as Fort Brisebois and was the birthplace of the city known as Calgary today. A modern interpretive center features several exhibits showcasing the history of the city and guided tours take visitors through the beautiful landscape surrounding the fort and the historic Deane House, Home of the Superintendent of Fort Calgary, Captain Richard Deane. Interactive displays allow visitors to try on an authentic RCMP uniform and pay a visit to the fort’s jail, offering a truly hands-on experience. 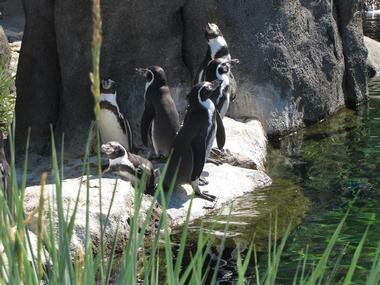 Located on St. George's Island in the middle of Bow River, the Calgary Zoo, Botanical Garden & Prehistoric Park is one of Canada's largest animal parks with more than 1,400 animals living in a variety of natural and diverse habitats. The zoo features several ecosystems in which visitors can experience the animals as they would exist in the wild, including a unique nocturnal exhibit called Creatures of the Night; a Mesozoic landscape featuring 22 life-size dinosaur replicas known as Prehistoric Park; and the endangered ecosystems of Canada in the exclusive Canadian Wilds section. If you are looking for fun things to do in Calgary with kids, this is a great place to visit. Explore the plains of Africa in the Destination Africa area, which showcases two African ecosystems, namely the African Savannah and TransAlta Rainforest, and is home to the largest indoor hippo habitat in North America. Fast-paced and exhilarating, Skyline Luge Calgary is one of the city’s most popular attractions. Located at Winsport Olympic Park, the luge covers a distance of over 5,905 feet (1,800 meters) on a continuous downhill trajectory making it one of the longest in the world. More than 50 twists and turns excite even the toughest adrenalin junkie and visitors of all ages can join in the fun. 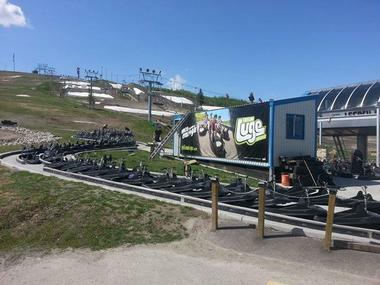 The custom-built luge carts are gravity-fueled and a unique braking and steering system allows the rider full control over speed, direction and braking and safety helmets are provided for every rider. Prince's Island Park is a beautiful urban oasis in the heart of Calgary that provides the residents with a beautiful green space in which to enjoy a variety of recreational activities. Established in the 1950s, Prince's Island Park features several picnic areas, water fountains and playgrounds for children, winding pathways and hiking trails, flowers gardens and canoe access to the river in the summer months. Winter provides excellent opportunities for cross-country skiing and outdoor skating on the lagoon and the River Café is the perfect spot to relax over a coffee. Snaking along the East end of the Park is the Chevron Learning Pathway, which is an environmental educational pathway and recreational resource constructed around a protected wetland area. The Park also hosts several large events throughout the year, including the Calgary Folk Festival and Canada Day celebrations. The Glenbow Museum is dedicated to inspiring and encouraging people to experience art and culture. Established by well-known philanthropist Eric Lafferty Harvie, the Glenbow Museum features a variety of world-renowned traveling and permanent exhibitions, showcasing the largest art collection in Western Canada. Home to more than 33,000 works dating from the 19th century to the present, the Museum’s collections focus on works pertaining to the northwest of North America and several permanent exhibitions on the third floor of the museum tell the story of Southern Alberta and the West. Glenbow's Library and Archives is an important research center for historians and students and alike, and the Museum offers a range of art-based educational programs to children of all ages, including the School Programs and Chevron Museum School. The Glenbow Museum can be hired for corporate and private functions: it offers a 210-seat theater, meeting rooms and three gallery floors as event space. Standing 191 meters above street level, the Calgary Tower offers breathtaking 360° bird’s eye views of the city below and further afield to the foothills and prairies of the majestic Rocky Mountains. Visitors can enjoy a guided tour of the Tower, beginning at the modern Visitor Information Centre and winding through the history, landmarks and future plans of this popular attraction. After the tour, dine in style at one of two restaurants in the Tower. Sky 360 is located 155 meters above street level and slowly rotates during lunch and dinner, and Ruth’s Chris Steakhouse, which is on the second level of the Tower and serves excellent steaks. Located just off Blackfoot Trail and Heritage Drive, the Calgary Farmers' Market is an inviting market held every Thursday through Sunday throughout the year that features over 80 vendors selling their locally-sourced, handmade and homemade products. Laid out in an easy-to-navigate system, visitors to the market can find everything from fresh, seasonal produce, such as fruits and vegetables, herbs, flowers, meat, poultry and fish, prepared foods and baked goods, organic products, handmade jewelry, clothing and more. 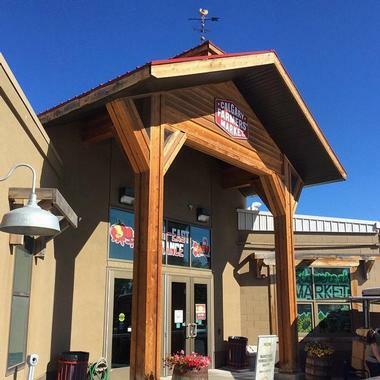 The market also hosts several events each weekend, ranging from chef-guided tours of the market, book signings, and kids’ cooking classes. 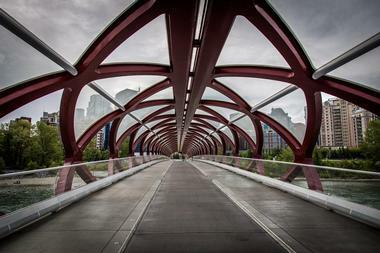 The Plus 15 or the +15 Skywalk is a network of public pedestrian walkways and paths that link buildings in the Downtown area of Calgary and provide alternative routes for pedestrians to various destinations in the city. Covering a total length of 11 miles (18 kilometers) with over 62 bridges, the pathways of the system are located approximately 15 feet (4.5 meters) above street level and are secure, convenient and weather-protected for pedestrian comfort. 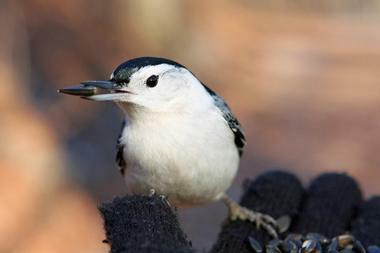 The Inglewood Bird Sanctuary and Nature Centre is a large wildlife reserve located southeast of Calgary that serves as a resting place and home to over 270 species of birds. The center has been providing migratory birds with a place to rest since 1929 and to date 270 species of birds, over 20 species of mammals and nearly 350 species of plants have been recorded. The Nature Centre is open to visitors year-round and offers an array of interpretive exhibits and information about conservation and local wildlife. The Center also provides a range of nature-based activities, such as birding adventure courses, volunteer opportunities, summer day camps for children ages 4-12 years, and school programs for all grade levels. The Calgary Stampede is a non-profit community organization that preserves and celebrates western heritage, culture and commitment to the community by presenting a year-round calendar of events such as exhibitions, expositions galas, concerts, conferences, and rodeos. 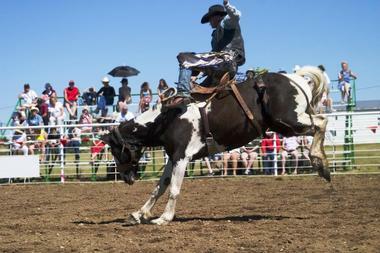 The most popular event on the calendar is the annual Calgary Stampede (July 8 – 17, 2016), a huge rodeo festival with a variety of live music, entertainment, exhibits, food and beverage stalls, and of course, rodeo shows! The Calgary Stampede also offers a range of youth initiatives and community programs aimed at getting the community involved and inspiring interest and understanding of Western culture. The Calgary Philharmonic Orchestra (CPO) is based at the Jack Singer Concert Hall of the EPCOR Center for Performing Arts in Calgary, where most of their performances are held. Led by internationally renowned and award-winning musical director, Roberto Minczuk, the Orchestra presents over 85 concerts per season in a variety of genres, including Classical Masterworks, Classics Showcase, A Festival of Fairy Tales and Legends and Sunday Symphony for Kids. 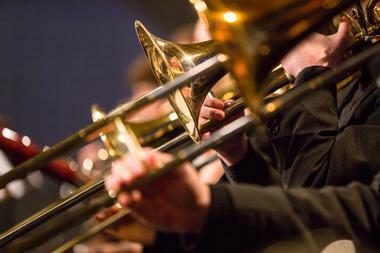 The Calgary Philharmonic Orchestra is also the resident orchestra of the Calgary Opera, the Alberta Ballet Company, and the Honens International Piano Competition. 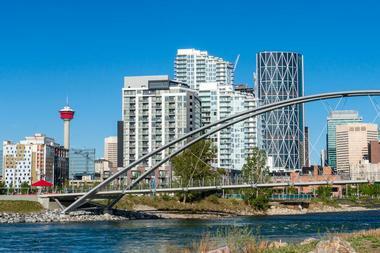 Experience Calgary one step at a time with an adventurous and informative walking tour of the city. 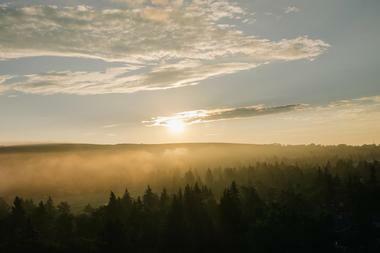 Tours are led by local Calgarians with a love of their city and a passion for sharing its hidden treasures. 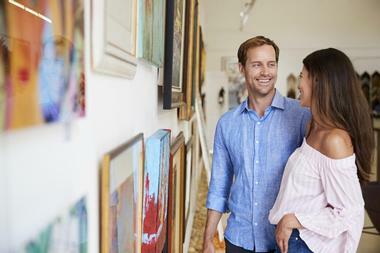 Visitors get a chance to explore the city’s rich tradition of art and architecture, history, and heritage. Visitors will get a face-to-face introduction to the city, visiting the most popular attractions and beautiful public places, learning the best spots to wine and dine and discovering how to get around downtown for free! The Bow Habitat Station on the Bow River consists of four popular attractions: the Discovery Center, where visitors can explore a variety of aquatic exhibits and aquariums; the Sam Livingstone Hatchery, which showcases what it takes to raise millions of trout each year; the Trout Pond, where kids and adults can fish for their trout; and an Interpretive Wetland, where visitors can explore the fragile ecosystems and aquatic habitats of the fauna and flora that call Calgary’s Pearce Estate Park home. Visitors to the Sam Livingston Fish Hatchery can enjoy a behind-the-scenes tour of the hatchery and learn all about the breeding of trout in one of the largest indoor fish hatcheries in the United States. 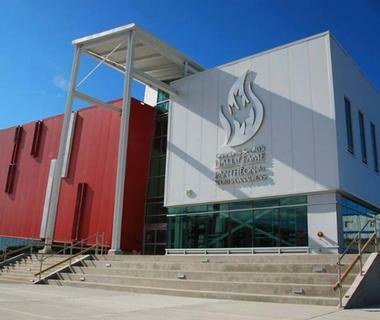 Canada’s Sports Hall of Fame is an award-winning facility dedicated to honoring Canadian role models in sport. Based in a vast 40,000-square foot building, Canada’s Sports Hall of Fame showcases the stories of inducted ‘Honored Members’ with a collection of more than 95,000 artefacts, 52 hands-on interactive exhibits and displays in the Grand Hall, touch-screen sport lessons and 3D simulations, a truly inspiring “Canada’s Greatest Sports Moments” film in the Riddell Family Theatre, and sports challenges in the Changing Gallery. The center also features an Education and Resource Centre for educational programs and the Pepsi Café, where you can bring your own snack or lunch. 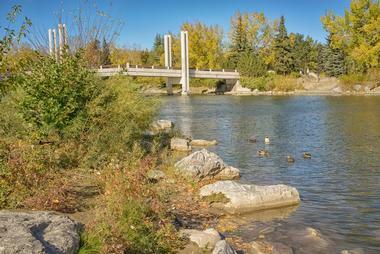 Carburn Park is a large natural area park located on the banks of the Bow River that is home to an incredible array of wildlife, waterfowl, and wildflowers. 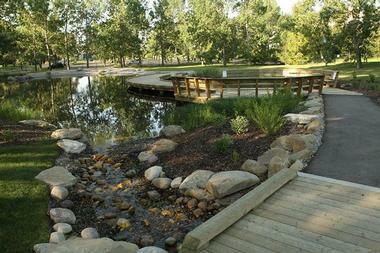 The park features three large man-made ponds, which attract a plethora of wildlife to the area and create an idyllic place for Calgarians to enjoy recreational activities and the great outdoors. Visitors to the park can enjoy fishing and non-motorized sports such as canoeing and paddle boating on the ponds in the summer and ice skating in the winter, as well as picnicking on the lawns or hiking along one of the many trails winding through the park. Nose Hill Park is a beautifully maintained natural park on the outskirts of the city that is home to an array of fauna and flora and offers visitors a variety of recreational activities to enjoy. Surrounded by several residential communities, Nose Hill Park has numerous hiking trails for walking, hiking and cycling and dedicated off-leash areas for dog-walking. The park has one of the most significant examples of Rough Fescue grassland, a unique grassland ecosystem from Canadian prairies, as well as a variety of trees, shrubs and wildflowers that are native to Canada. Keep an eye out for large mammals such as deer and coyotes, as well as porcupines, ground squirrels and gophers that call the park home. 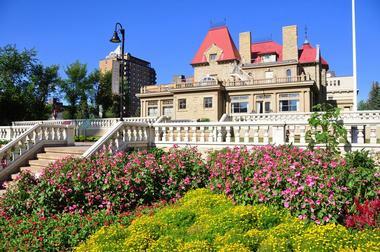 Lougheed House was built in the late 1800s as a residence for the Lougheed family and now stands as a Provincial and National Historic Site and Museum that is open to the public. Formerly known as "Beaulieu" (French for ‘beautiful place’), Lougheed House has had many faces, including a family residence, center for young women, women's military barracks and a blood donor clinic. The house was restored to its former glory in 2000 and today is open for the public enjoyment of the historic house and its beautiful surrounding gardens. Self-guided and audio tours are available during opening hours at the museum and are led by costumed interpreters, who share their passion and knowledge of the history of the house and the important role it played in Calgarian society. Spruce Meadows is a world-class equestrian facility that hosts several annual equestrian events and tournaments, such as the indoor 'Nakoda Series' and the outdoor 'Summer Series'. Spruce Meadows also breeds, trains, and sells Hanoverian horses and holds the popular annual ‘Name the Foal’ contest, where the public gets the chance to name a newborn foal. Spruce Meadows runs a variety of interactive educational programs geared towards young children which focus on subjects like agriculture, horse anatomy, health and welfare, equine history and wetland ecosystems. 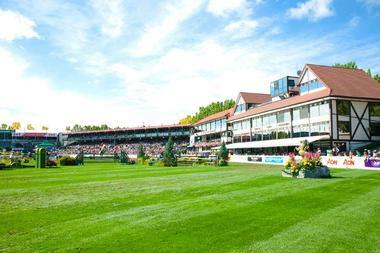 Spruce Meadows is open to visitors year round, who can explore the grounds, stables and watch horses being trained. © Treehouse Indoor Playground Inc.
Treehouse Indoor Playground Inc. is a fun indoor playground geared towards children that are 13 years old and under. The playground offers an exclusive space for children to play freely in a safe and age-appropriate environment while parents relax in a comfortable setting. The playground is over 12,000 square feet in size and offers a broad range of play structures, games, exercises, and rides, as well as an arcade room, a dancing hall, a rock climbing wall, and a special toddler’s area. Parents can relax over coffee and light snacks in the comfortable café area while their children play and can hire the Treehouse Indoor Playground for special occasions and birthday parties. 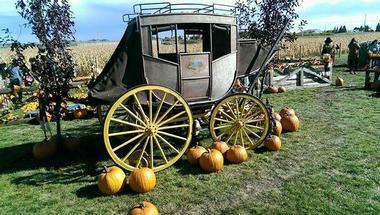 The Calgary Corn Maze & Fun Farm is an award-winning recreational facility and play farm for children of all ages. The farm features a wide variety of fun-filled attractions for children to enjoy in a safe environment, including trampoline-like jumping pillows, foam paintball, pig races, a grain train and a real working mine sluice where children can learn more about mining for precious stones. Treehouse Indoor Playground Inc., Photo: Treehouse Indoor Playground Inc.